I love this game because they read, and reread and reread… It’s like a triple whammy of comprehensible input! This one is especially fun because of the element of luck…That’s the secret to a fun game. Add an element of luck and your game will instantly be 10,000 times more fun. Guaranteed. How to play: Pass out a reading/story/article to all students and divide the class into small groups (4-5 students). As a group they are responsible for reading/ translating the story and making sure that everyone in their group understands every word. If groups finish early, they should predict questions the teacher may ask about the reading and quiz each other. Meanwhile the teacher sets up chairs at the front of the room, one for each group, and puts a marker, eraser and whiteboard on each chair up front. In my example, I have 4 groups, so there are 4 chairs set up in front. Once everyone is finished reading/translating, tell students to decide their order within their group: Who will go first, who will go second, etc. Each group sends their 1st participant to a chair at the front. (So each of these boys represents a different team). Teacher asks a question from the reading (either in English or Spanish) and students write their answer on their board without any help from their group. The teacher counts backwards from 5 and on 1, students show their answer to the teacher and the class. 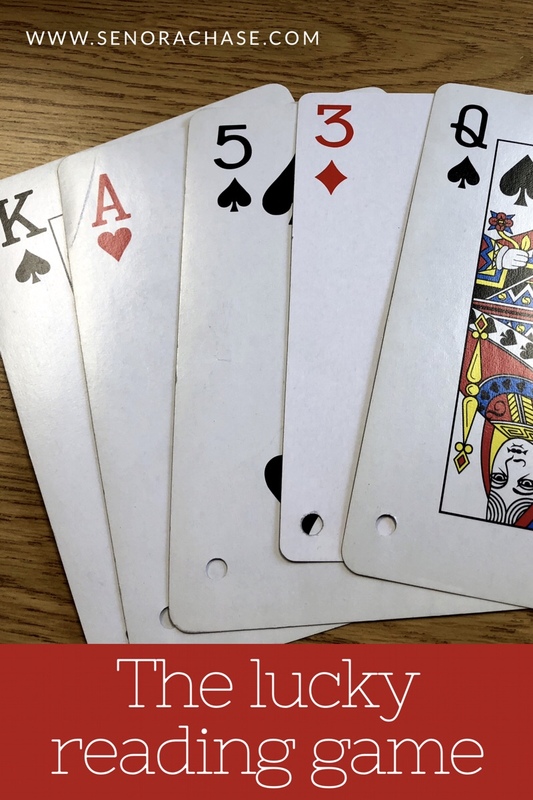 All students with correct answers get to draw a playing card to determine their points. Just to make it especially fun, we use Gigantic Playing Cards . In the picture above everyone got the right answer, but they will all earn a different scores based on the card they draw. If you play with another language and you translate this slide, I’d love to include it here! The beauty of this game is the cards! No one knows who is winning until the end, so no one gives up or stops trying. Additionally, since the random Red Three is worth the most points, every round students are hopeful they’ll draw the Big Money card. Adds to the excitement! Tell students that the questions will be in order and encourage them to read ahead (and re-read!) to predict what question will appear next. I’ve never tried this, but I had a new idea while we were playing today: give students highlighters and the students who are in their groups should highlight the answers as the teacher is asking the question, to help them predict what question will come up next. YES! More reading! More input! I’m totally doing this the next time we play! Of course at the end of the game, teams add up their accumulated cards and the winning team gets a stamp on their stamp sheet. Pro Tip: Coach the kids to transition quickly between rounds. No time for dilly dallying! Want to see a few rounds in action? Here my Spanish 1 class is playing. They have just read an article about Café Restaurante Robin Hood , a restaurant/ soup kitchen in Madrid. Previous The day I cried then ditched the desks. How long would you say the readings are, a few paragraphs, a small chapter form a book in the TL? You can do whatever- just think about how much time it will take them to read the reading and plan accordingly. We usually do a 1 page reading but I love the idea of assigning a chapter for them to read together and then playing! I am going to try this game with my students this week! Thanks so much for sharing! How long would you recommend spending on this game? I know it varies from class to class, but how long do you think your students would remain engaged in this? Is the “Red 3” the 3 of diamonds too? Or just the 3 of Hearts? I tried this out in my German class and they liked it. I had a logistical question for you though! How do you keep the transitions from taking up too much time? I lost a few minutes between very question because they got excited when shuffling out teammates. I loved the engagement, but I would like to be able to ask more questions in the future. A few thoughts: first coach them that as soon as the draw a card, they’re to go to their seat and the next player comes up. I tell them, by the time I’m down with the last player drawing a card, everyone else should be ready to play the next round. Also, if you’ve got 5 teams and 4 are ready for the next round, ask the ? Anyway. They’ll realize quickly that their team will miss out of they don’t mean w quickly between transitions. Another thing that might help: you could count backwards from 10-1 between rounds to give everyone that sense of urgency! If you’d like an editable copy of the score card, send a “request to edit” and I’ll share it with you! Love it! I made my own version of yours already, but I appreciate the offer! We German teachers are used to working off of our Spanish teaching colleagues resources :D. Thanks for the tips! I finally played this today and loved it! A couple of things I added: any team that causes a game delay for being not ready (not in chair, or talking in their groups) loses a point each time. I also gave and subtracted sportsmanship points each round if they clapped for/celebrated their teammate. It kept the kids in the seat a little more engaged with what was going on. YAY! I’m glad it worked for you!! I like adding and subracting points for sportsmanlike/ unsportsmanlike behavior! I would love for the German teacher to share her points screen! I haven’t had a German Teacher offer to translate it! If you can translate it, that would be awesome! Pingback: Input-Based Strategies & Activities | Magister P.